This post is sponsored by Simple Mills, a brand I am thrilled to work with! Summer is officially here! Don’t you feel like this year is just flying by? I always wondered why adults said that when I was younger, since time always seemed so slow to me. I was talking about this with a friend recently, and her theory is that days and weeks seem to go by faster as we age because each is a smaller fraction of our life than it was when we were younger. I think there’s something to that, but also to the lack of milestones that come with adult life. Every day and every week is, give or take, about the same: go to work, come home, make dinner, watch TV, sleep, repeat. That sounds pretty dull, doesn’t it? I think if we let it, life can pass us by in this way, year by year, until we don’t know where it went. I’m determined not to let that happen. Every day can be wonderful and magical if we work at it – you just have to relish the little things, rather than waiting for the big things, like vacations or weddings or a new Game of Thrones season. For the past few months, I’ve been making a determined effort to savor the small things every day: my morning coffee, my walk to work, a really nice-smelling shampoo, a great song on my spotify, peonies at the farmer’s market, walking by the lake with Brian at sunset, the way a ripe summer cherry is sweet and tart and cool all at once. It’s all lovely, but it’s ephemeral; if you don’t stop to savor it, it’s gone. One of the things I savor most in the summer, as alluded to above, is the abundance of berries and summer fruit. It’s almost unfair how many amazing fruits are at their best only in the summer: peaches, blueberries, strawberries, cherries, plums, figs…and raspberries. Oh man, raspberries are so good in the summer. 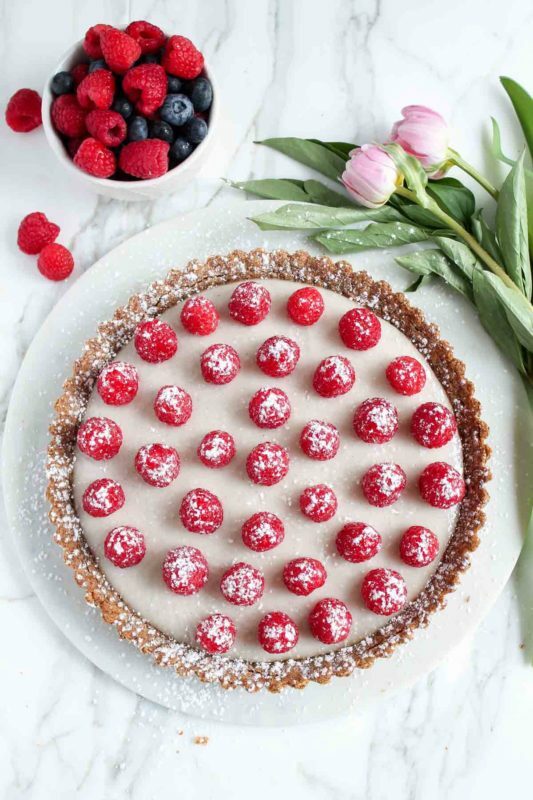 Which is why we must take advantage, and why I’m so excited to share the recipe for this raspberry coconut tart with you today. 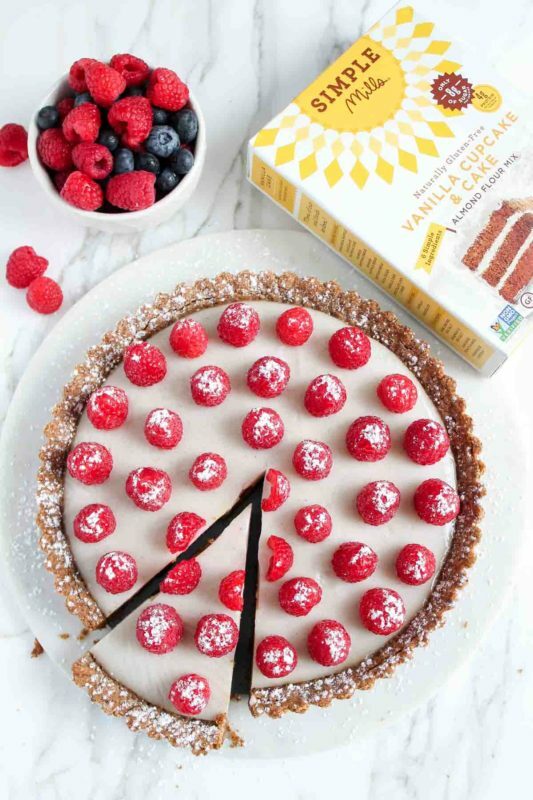 I developed this recipe in partnership with Simple Mills, a Chicago-based company that’s really changing the game when it comes to baking mixes. You know that I don’t generally use baking mixes, and it’s because I believe baking from scratch can be just as easy and effortless as baking from a mix, without all the weird stuff. 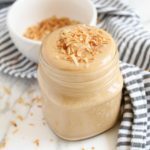 Simple Mills shares that vision: all of their mixes are made with real ingredients like almond flour, coconut flour, coconut sugar, coconut oil, baking powder, and sea salt. Their mixes are naturally gluten-free and contain all of the ingredients I would reach for in my cabinet to make an almond flour-based recipe, but pre-measured. I’m all about spending less time in the kitchen in the summer, and more time savoring life! 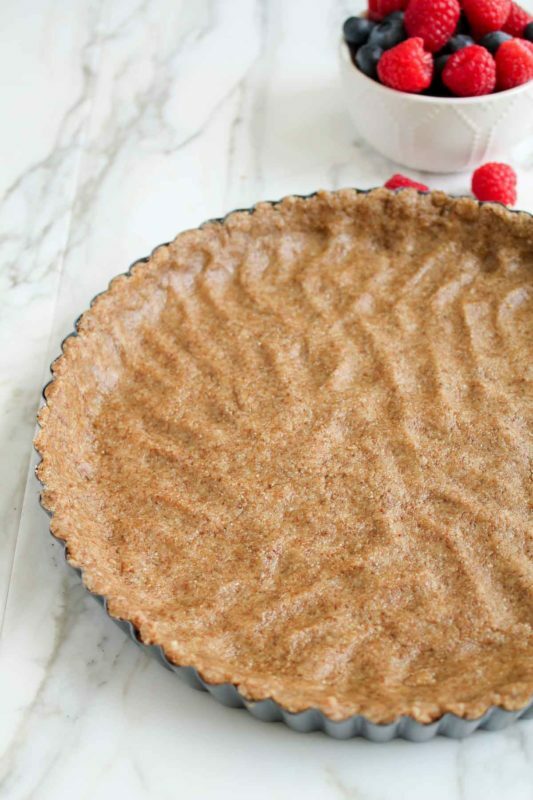 I used the Simple Mills Vanilla Cake Mix to make the crust for this raspberry coconut tart. One of the things I love about their mixes is how adaptable and versatile they are, since they’re made with such simple ingredients. 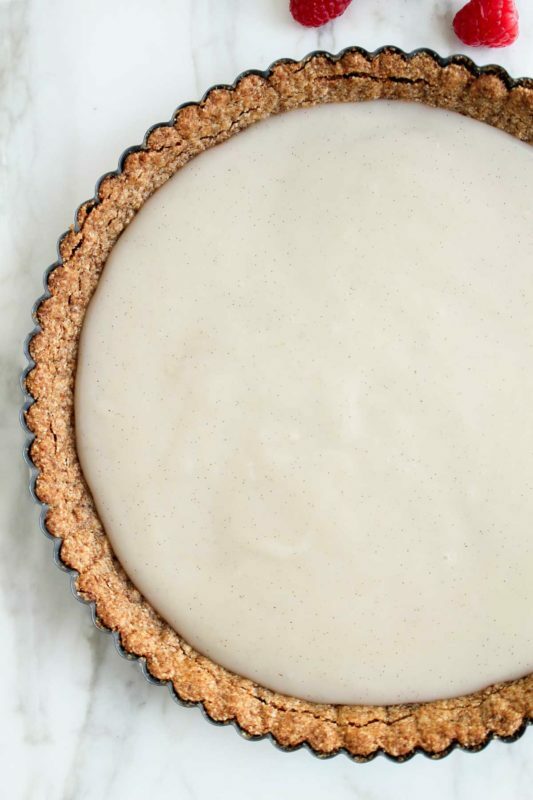 Just combine the mix with melted butter, and voila – tart crust. 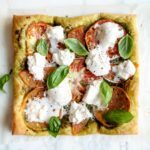 You’ll need a tart pan for this one with a removable bottom – they aren’t too expensive and definitely worth the investment! You could probably also do this in a pie pan, in a pinch. While the crust bakes, we’re making a coconut vanilla custard for the filling. I’m so addicted to this custard, and it’s so easy to make! Custard is usually a bit of a scary affair, but this one isn’t intimidating at all, I promise. 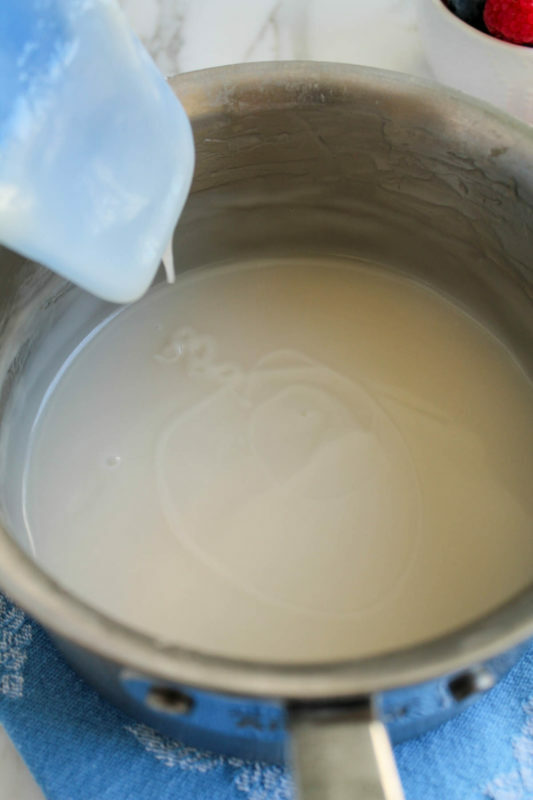 Just cook canned coconut milk with cornstarch, sugar, and a pinch of salt. The cornstarch thickens the milk and makes it a lovely pudding/custard consistency in very little time. You’ll know it’s done when you can drizzle a ribbon on top and it holds its shape on the surface – see the picture above. I stirred vanilla bean paste into it after cooking to get those vanilla flecks in there. Pour that yumminess into the baked crust and chill for a couple hours to set. Once the filling is chilled and set, arrange some beautiful raspberries on top and sprinkle with powdered sugar! 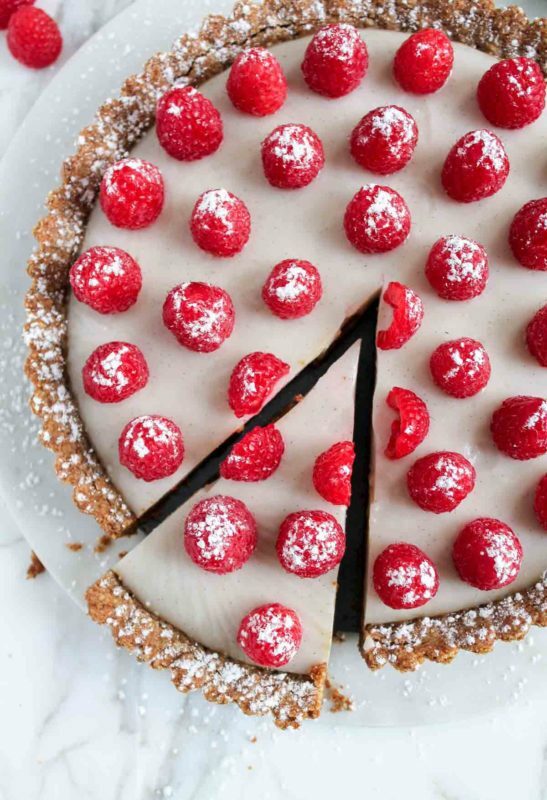 This raspberry coconut tart is summer perfection. 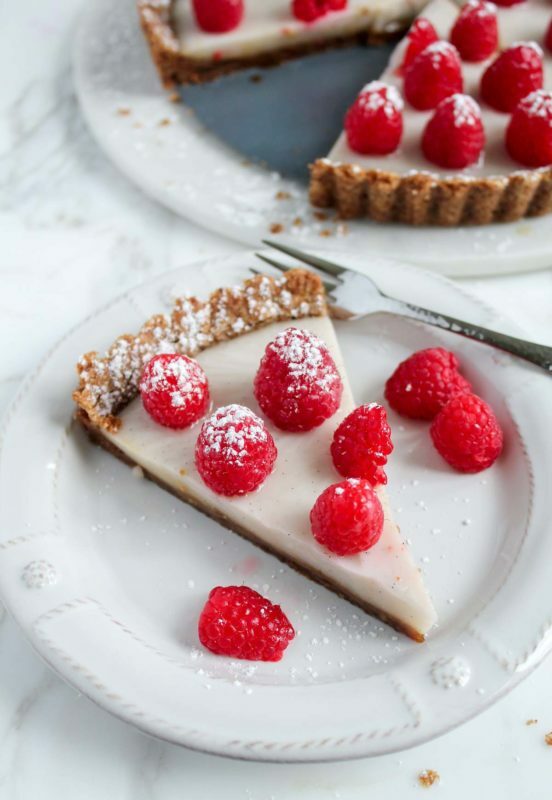 I love how the sweet coconut custard and the vanilla almond crust pair with the tart raspberries. 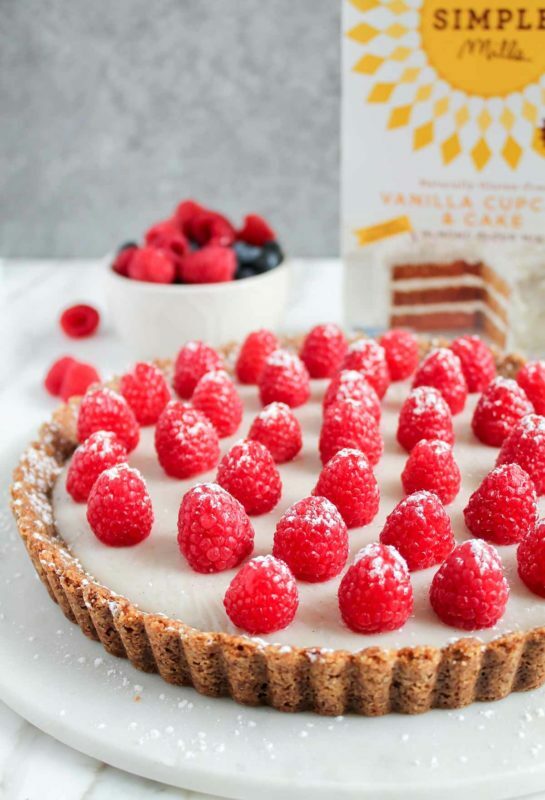 The Simple Mills cake mix is perfect as the crust – it’s nutty, buttery, and just solid enough to hold the filling without being rock hard like some crusts can be. I served this tart for a late brunch for my mother-in-law’s birthday, and my guests loved it! If you want to play around with it, I think any berry on top would be lovely, or even your favorite jam. 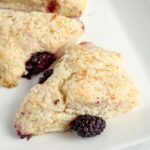 It would be perfect for a 4th of July barbecue with raspberries and blueberries on top, for a wedding or baby shower, or just for a weekday when you’d like to savor all that summer has to offer. I ate it for breakfast one morning with no shame. 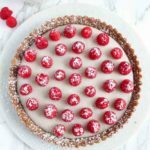 This raspberry coconut tart is made with a vanilla and almond flour-based crust and coconut custard filling. The raspberries on top are perfect for summer! In a medium bowl, mix melted butter or oil and Simple Mills Vanilla Cake Mix with a fork until thoroughly combined. Press evenly into a 9-inch fluted tart pan with a removable bottom, making sure you get it up the sides. Bake for 17-20 minutes, until browned at the edges and slightly puffed. Use the back of a spoon to press down on the bottom where the crust rose. Set aside for a few minutes to cool. While crust is baking/cooling, make the filling. Add the coconut milk, cornstarch, sugar, and salt to a medium saucepan and whisk to combine, making sure you get all the cornstarch lumps out. Cook over medium heat, whisking nearly constantly, until the mixture comes to a light boil and is bubbling. Reduce the heat to low and keep whisking constantly, so as not to burn. Keep cooking and whisking until the mixture is thickened and you can drizzle a defined ribbon of the mixture on the surface with your whisk, and it holds its shape. This should take about 8-10 minutes total. Off the heat, stir in the vanilla paste or extract. Pour the mixture into the baked crust. Let cool for about 5 minutes, then put plastic wrap directly on the surface of the custard (it will develop a "skin" otherwise) and place in the refrigerator to chill for at least 2 hours, up to overnight. When chilled and ready to serve, remove plastic wrap, arrange as many raspberries as you'd like evenly on top of the custard, and dust with powdered sugar. Enjoy! Tart is best the day it's made, but will keep, covered in the fridge, for up to 3 days. This post was developed in partnership with Simple Mills, but all thoughts and opinions are my own. I’m very happy to be working with a brand that aligns with my vision of teaching everyone to bake with real ingredients. Thank you for supporting the brands that make Katiebird Bakes possible! Thanks so much for sharing your recipes. I had one question – what brand of tart pan do you use? I’m interested in investing in one. Hi Edgar – I use a 9-inch round tart pan with a removable bottom, doesn’t really matter what brand – here’s a link to one that looks similar to mine!